Plumstead Township was formed shortly after 1700 by English Quakers who came to Pennsylvania to help fulfill William Penn's dream of a land of religious freedom. Plumstead Friends Meeting, founded in 1727, was the township's first religious establishment, but diversity soon followed. A German Mennonite church at Groveland was formed in 1806. Later settlements were Scottish and Irish, and eventually many of the township's inhabitants were of German extraction. Plumstead formed part of the border between areas primarily British and German in Bucks County. In 1725, a petition was presented by a group of residents to the Bucks County Court, organizing Plumstead Township. Already, small villages had begun to grow around the township to support what was at first an agricultural community. With the much traveled highway from Philadelphia to Easton, today's Route 611, running in a north-south direction and another main road running east and west, Point Pleasant Pike/Ferry Road, business and industry began to evolve. There were inns, blacksmiths, a gristmill, general stores and a large carriage works. Some of Plumstead's more famous residents were the Doan Gang, a group of outlaw's reknowned in the area during the latter part of the 18th century. Today, Plumstead Township is fortunate to have many of its farms still functioning and often by families that have owned them for generations. 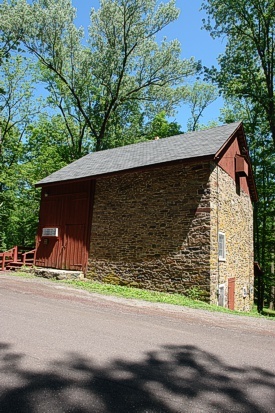 Plumstead Township is located in the eastern portion of central Bucks County. It is a long, rectangular municipality that has a rich history as a place where many of the forces that shaped Bucks County have come together. Much of its terrain is steep and rocky, but it also has productive farmland. Its western portion is drained by tributaries of the Neshaminy Creek. Toward the east, streams rise which flow into the Tohickon Creek or directly into the Delaware River. The township extends from the Delaware River to Swamp Road, Route 313, once known as Dublin Road. Philadelphia is 40 miles south, approximately 35 minutes away. New York City is 80 miles north averaging an hour and a half driving time. 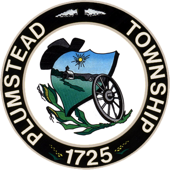 Plumstead Township is designated as a second-class township and is governed by a five-member Board of Supervisors. The Township provides many municipal services including: police, water, streets, parks maintenance, zoning, code enforcement, historical planning, and administrative services. Fire and ambulance service are provided to the community by the Plumsteadville Volunteer Fire Company, the Point Pleasant Volunteer Fire Company, and the Point Pleasant/Plumsteadville Ambulance Corps. Plumstead Township is made up of 27.8 square miles, which equates to 17,792 acres, 68.59 miles of road maintained by the township. The population of the township in the 2010 Census was 12,442.